In a previous post, I described my second attempt with Thomas Keller's recipe. While the first attempt was quite good, the second time round the meat came out quite dry, possibly due to the lean cut of meat. This third time, I decided to try a radically different recipe, the 80C for 24 hours. I am not sure why, but many blogs and articles on the Internet talk about the last two techniques, without explaining what exactly the difference is between the two. Well, the result is totally different. The 24 hours brisket was delicious, with an intensely flavoured juice out of the bag, and it broke to the touch. It was browned throughout, exactly like a traditionally braised beef brisket, except more flavoursome. The 48 hours @ 64C brisket was pink in the inside, still a little tough, and tended to be dry unless the cut of meat is well marbled throughout. So in conclusion, if you want a more fine dining sous-vide effect, then go for Thomas Keller's recipe (although I haven't yet been able to perfection this myself). If you are after a more traditional result, then the 80C for 24 hours will give you a great, reliable result. 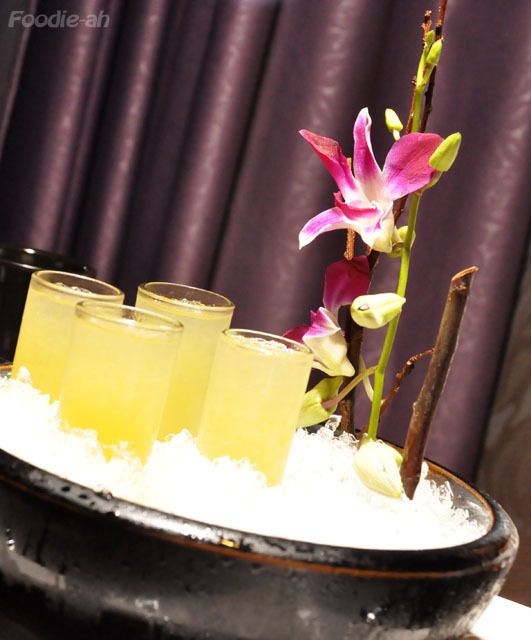 Dozo is a Japanese fusion restaurant located within Valley Point shopping centre. The setting is semi-pretentious and luxurious, and besides the main dining room, it provides separate rooms for private dining. The colors and deco are more out of a pretentious Chinese restaurant, rather than Japanese: vivid colours, abundance of soft furnishings and fancy wallpapers. 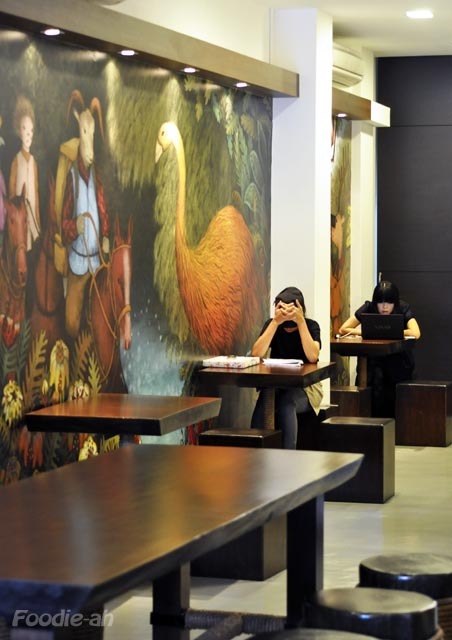 The dim lighting creates a pleasant atmosphere. Being in a group of 4, we got our own private dining room, which definitely benefited to the whole experience. I would highly recommend that you go with a group of friends and book a private room in advance. 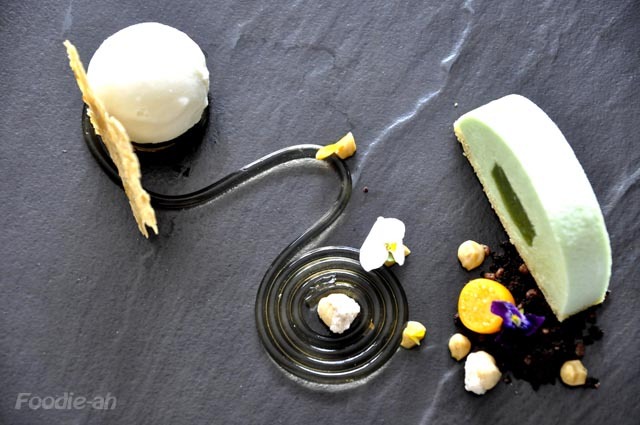 The food deal is good value for money, pricing a 7 course dinner at 59.80++. You get to chose each course from a selection of about 5 dishes each. 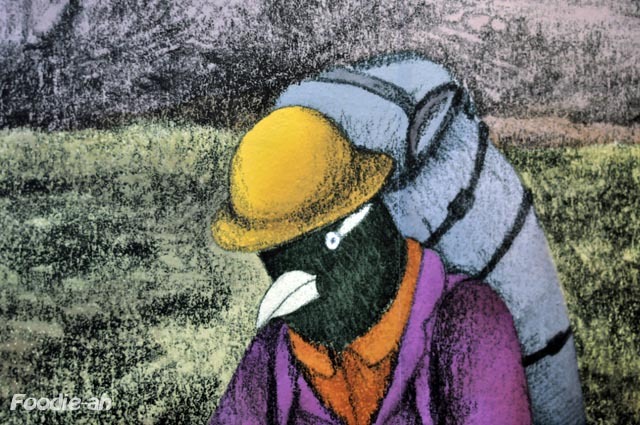 I must say that I found it difficult to compose my own meal since there were too many things I wanted to try, and there were quite a few conflicting choices. You can never complain about being spoilt for choice! After ordering the food, we were served a glass of ice cold fruity juice together with the amouse bouche. I must say we weren't incredibly impressed with the amouse bouche, which included smoked salmon topped with whipped cream, a pan seared scallop, and some foie-gras. I found that the whipped cream was a tad too sweet to be paired with the salmon, and the scallop too dry (probably pre-cooked). One of us also complained about the fact that the fruity drink which was served with the dish was so strong in flavour that the scallop couldn't really be tasted after savouring it. One of the best dishes I had that evening was also their signature dish. 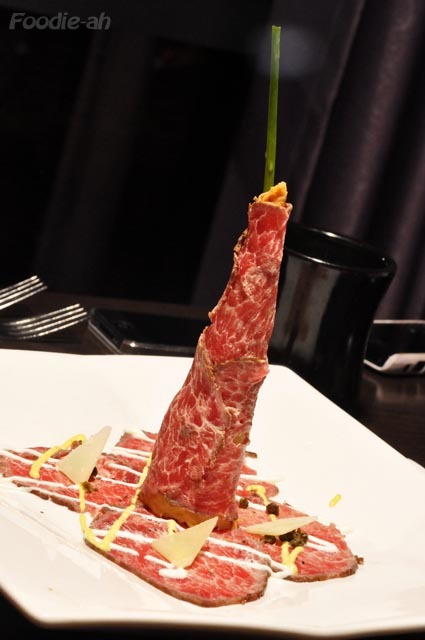 We all ordered the same cold dish, the beef tataki with shaved Parmesan and truffle mayo mosaic. The beef was nicely marbled, soft and thinly sliced. It was wrapped around a crunchy wafer whose drier texture actually enhanced the flavour of the beef. I would have this again. 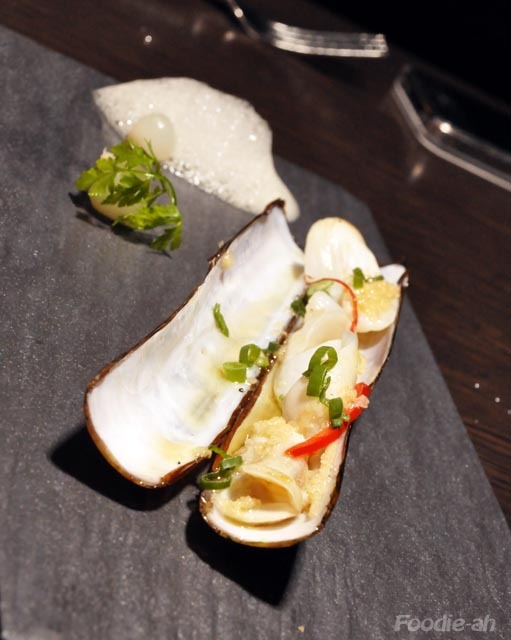 The steamed fresh bamboo clam, which was served as a side dish, was not as good a choice. The cooking style was more Chinese than Japanese or western, and I just found that the chopped garlic just covered any other flavour. The other side I had, the tempura battered soft shell crab, was up to expectation, served with a nice dipping sauce. 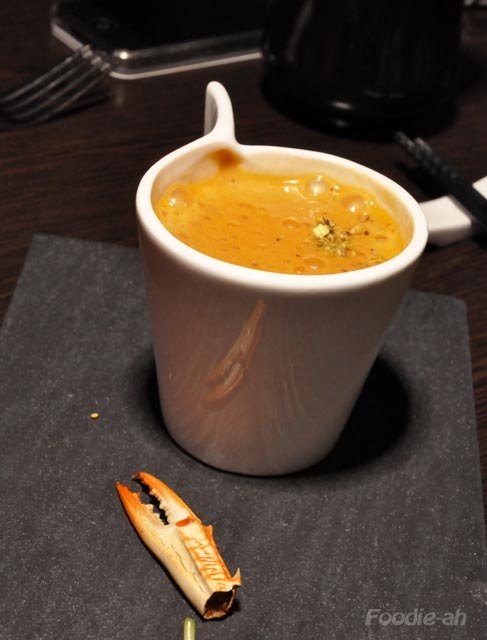 I personally loved the crab bisque cappuccino style. This was served in a coffee cup, and was extremely dense and foamy. The flavour was quite intense, but less striking than the texture. 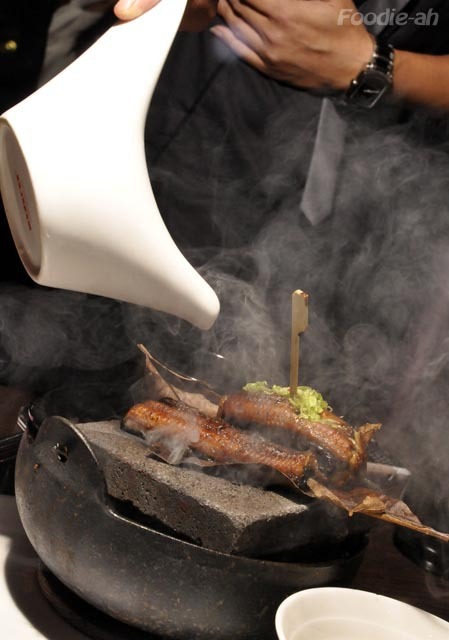 Coming to the main dishes, the Sake infused grilled unagi on hot stone was very good. Served as described on the menu, the sake was poured onto the eel right at the table, creating a show of steam raising from the hot stone as the alcohol evaporated. 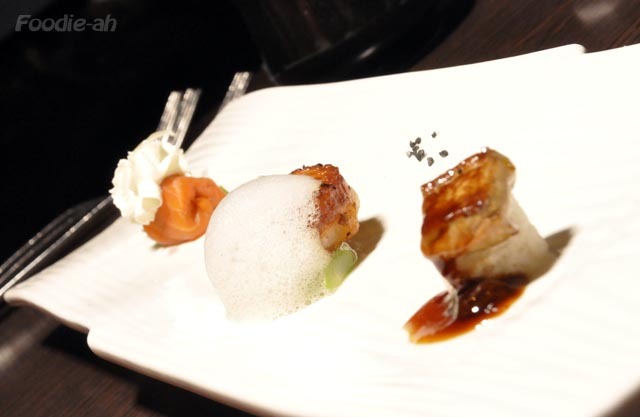 The rice that was served with the dish was flavoured with unagi sauce. This was probably the closest to Japanese food that I ate on the night. I had a baked Atlantic cod in basil sauce which didn't quite score it for me, when compared to the other dishes; wrong choice, I wouldn't recommend it. 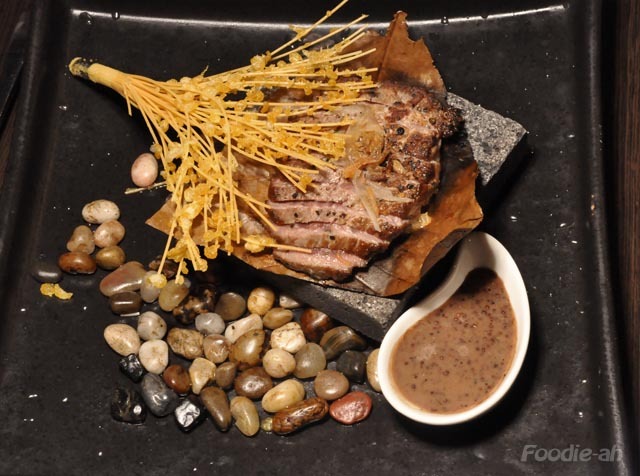 The beef tenderloin on "Pu-Ye" and granite hot stone was even more outstandingly presented, and with a flavour to match. The beef was tender and juicy, nicely seared and crispy on the outside. This would be my recommended choice for most. The herb-braised lamb shank was also very good, succulent and full of flavour. Overall, I think Dozo is well worth it, so long as you set your expectations right. 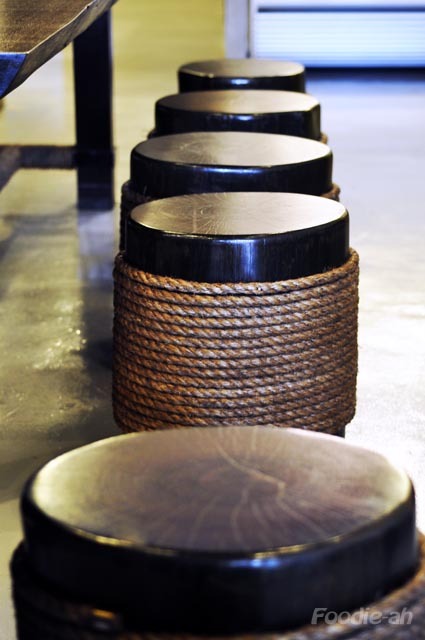 Don't expect Japanese food but rather some Japanese style flavours here and there - and don't expect Andre' Chiang. 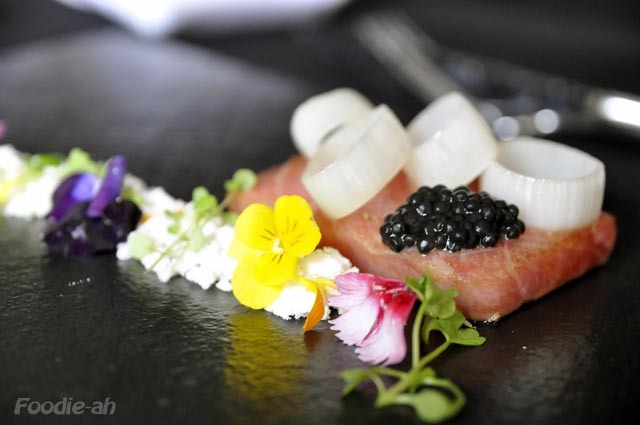 But you can certainly expect pretty good fusion for a very reasonable price, within a comfortably sumptuous setting that differentiates this place from most others. I always wondered what a 48 hours beef brisket cooked in sous-vide would taste like, and I tried this twice. Ironically, the first attempt was more successful than the first. Let's see why. I followed the recipe on Thomas Keller's cookbook, so I started from seasoning the meat with salt and pepper, then I seared it on all sides for about 7-8 minutes, until nicely browned. I then let the meat to rest for a few minutes, cooled it in some zip-lock bags that I immersed in water to speed up the cooling process, and finally placed the meat into the refrigerator to cool it for a few hours. 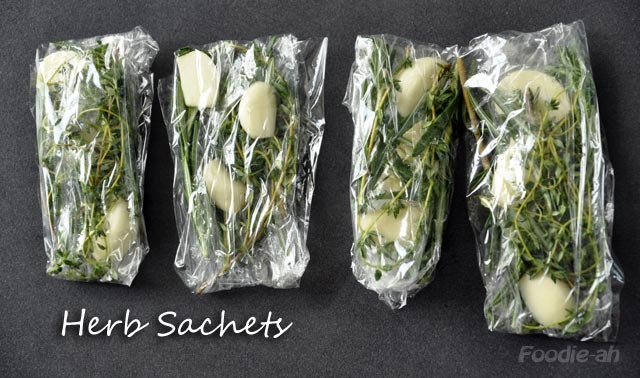 In the meantime, I prepared some herb sachets by wrapping 3 slices of garlic, and some sprigs of thyme and rosemary. I cut a few millimeters of the corners of the bags to create openings that the liquid could circulate through. I vacuumed packed the chilled briskets in individual packs, together with the herb sachets. As I mentioned earlier, I got different results out of the two times that I attempted this. Since the process was exactly identical, the conclusion is that the meat was quite different. I noticed that the briskets I used for second batch had substantially less marbling and were more uniformly red. I t was quite visible when the meat was raw, and it resulted into a pinker meat with less fat, and therefore drier when cooked. 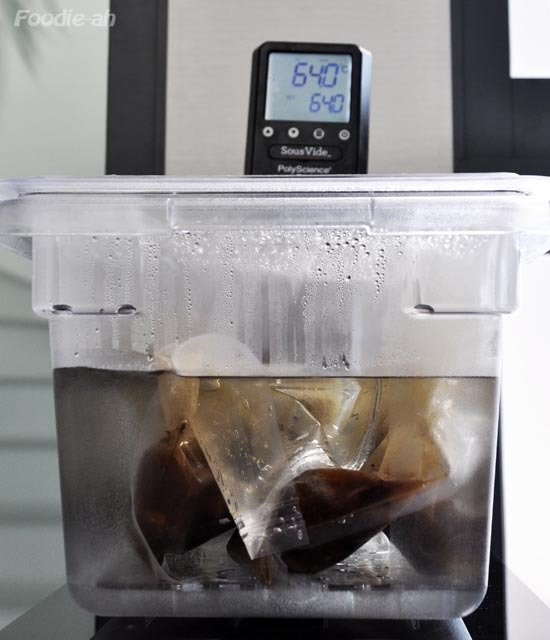 At the end of the day, this is all common sense which applies to sous-vide as much as it does to other more traditional cooking techniques. It just means I will pay much more attention to the cuts of meat I will be given from now on! To finish off the dish, I drained the juice from the vacuum bags while the meat was still warm, reduced them to a half and added a teaspoon of cream and one of horseradish to make the sauce. I sliced the briskets, slightly coated them in flour on the pink sides which I briefly pan-roasted. 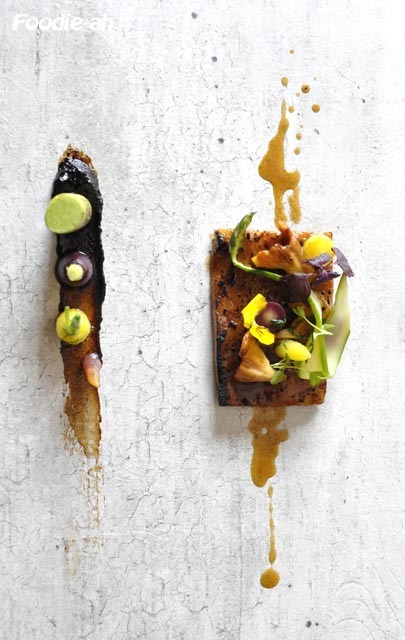 I finally served the slices on a bed of parsnips puree' and radicchio rosso on the side. What to do with the ragu' alla bolognese I made last week? 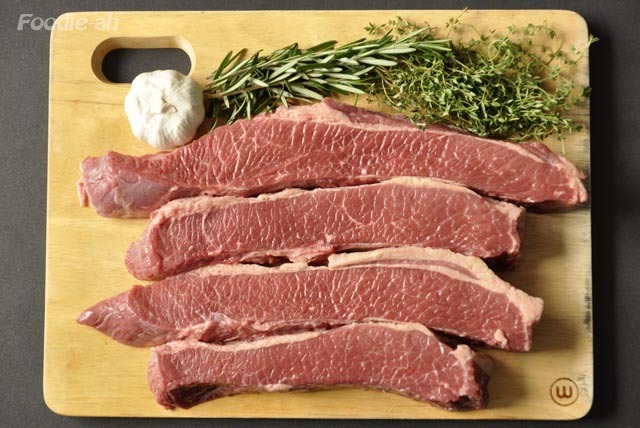 I decided to test it on this excellent product, which you can purchase at Huber's Butchery. 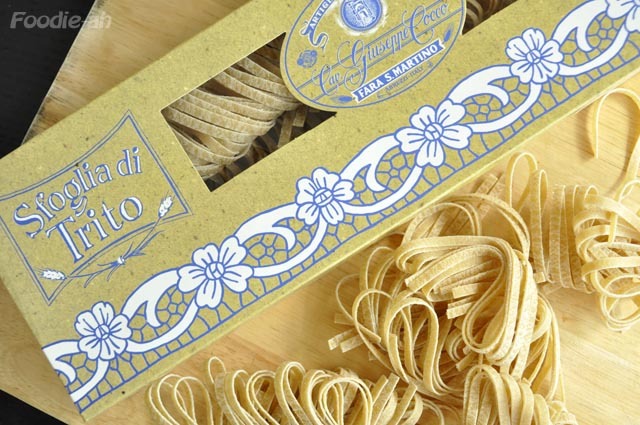 Pasta Giuseppe Cocco is one of the best brands available in Singapore. 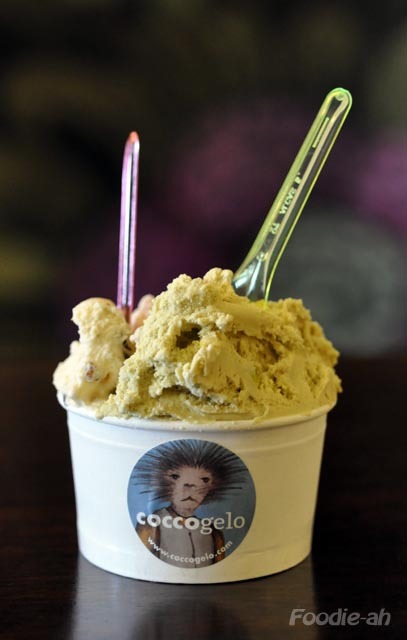 This particular pasta is made from "sfoglia di trito", which is a dough that is higher in bran content. 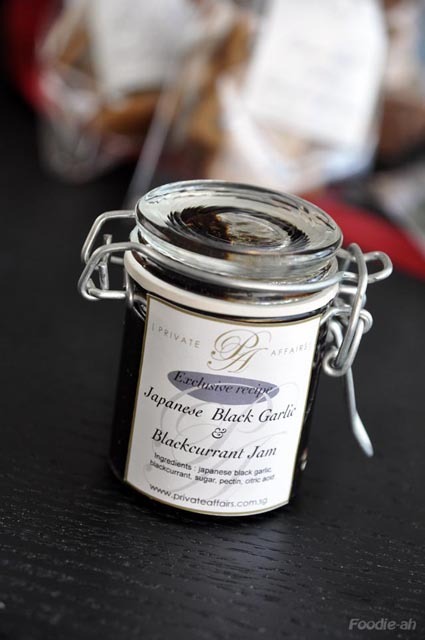 It is particularly indicated for rustic sauces due to its enhanced porosity and raw texture. It was indeed a great match for the bolognese sauce, topped with a sprinkle of Parmigiano Reggiano. 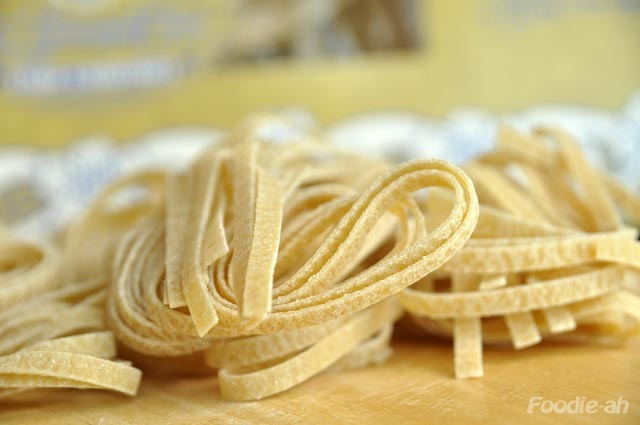 I must say that I was impressed a dry pasta could get so close to what feels almost homemade, and in my opinion actually better than homemade pasta, due to the firmer bite. 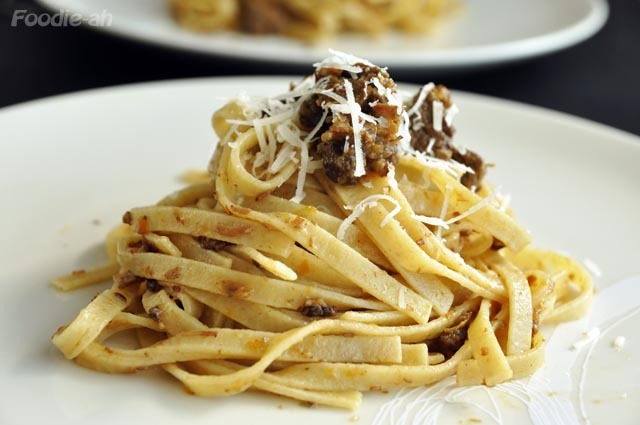 One of the most popular pasta sauces globally: Ragù alla Bolognese. You can find this wherever you go in the world, either served on some spaghetti (which is a type of pasta that should never be served with this sauce! ), or in between layers of lasagne. Sadly though, it is rarely of good quality and mostly prepared with leftovers rather than quality ingredients. This is one of those dishes that take time to prepare, but you can make in large quantities and freeze for later use, so it is well worth the effort, in order to appreciate the beauty of a quality Bolognese sauce. Ragù is a term deriving from French (ragôut) to indicate sauces based on a combination of meat, vegetables and tomatoes. 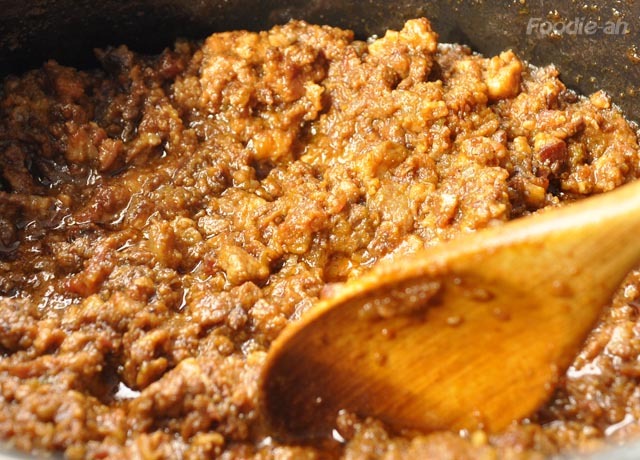 There is an official recipe for Ragù Bolognese, which has been agreed upon and deposited with the Bologna Chamber of Commerce. More detailed information on the original recipe can be found here. Since this is a blog, I will describe my own recipe, which is pretty similar to the original, with a few variations primarily constrained by availability of the ingredients. Although the original recipe is only based on beef, nowadays people tend to use 50% beef and 50% pork to "lighten" the sauce. I personally like pork, so I went for the 50-50 mix. 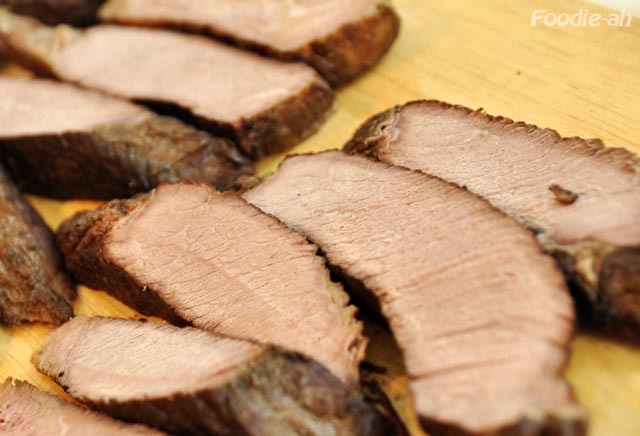 I decided to use beef brisket, which is a fairly inexpensive, tasty cut, ideal for prolonged cooking. I mixed the brisket with as much pork, some of which was belly and some of which was shoulder. 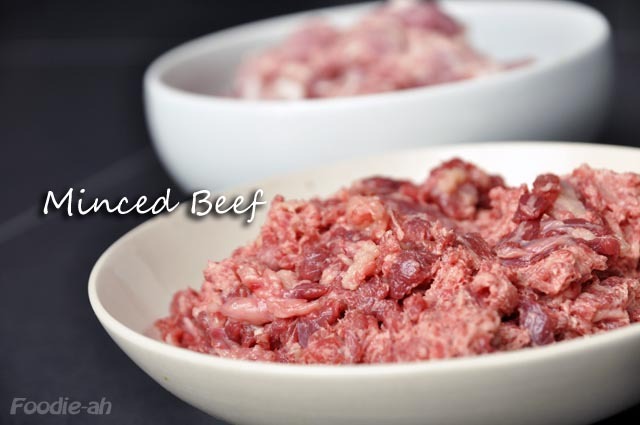 I didn't buy minced beef/pork, since I like to chose the exact cut I want, and also because hand-shredded meat results into a different texture. 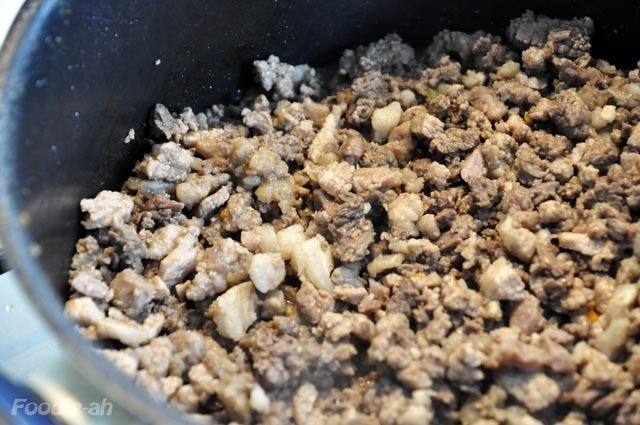 I hand-chopped the beef and pork, and then I lightly minced 40% of it using an immersion blender. The result can be seen in the picture above. 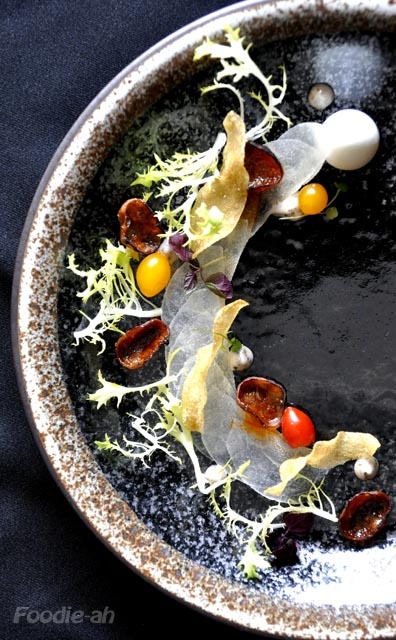 One ingredient that is hardly available to the public in Singapore is pancetta. This is not commonly sold in supermarkets/butchers, and even if you could get hold of it, it would probably be too expensive to be fried into a Bolognese sauce. For this reason, I recommend to use some quality bacon instead. 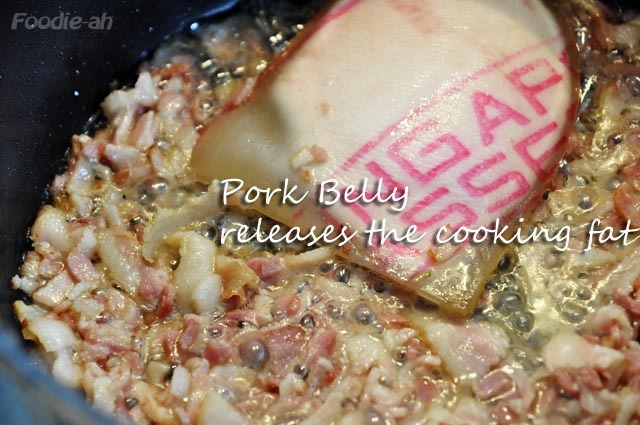 Start by removing the fat from the pork belly, and rendering it in a non-stick pan, without any added oil. 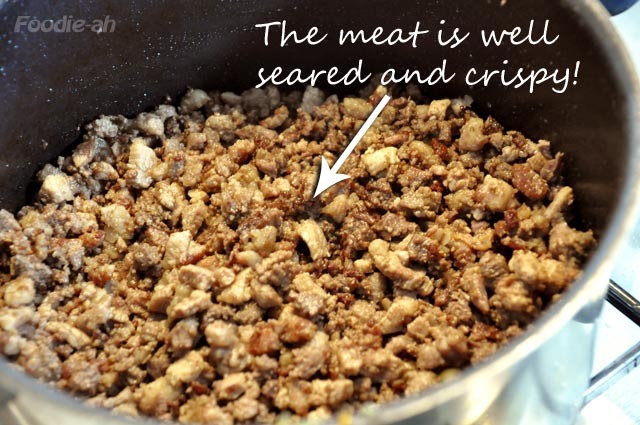 When the fat almost completely melted, discard the remaining lumps of fat and skin, and add the chopped bacon. 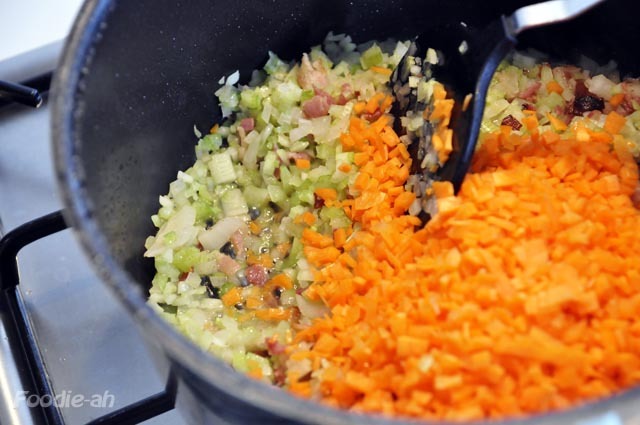 Fry it gently for about 10-15 mins until crispy, then add the finely chopped carrots, onions and celery, to make what in Italy we call soffritto. These need to be sweat slowly for about 15 minutes until soft, then removed from the pan. Time to add the chopped beef and pork, mixing vigorously to rapidly expose it to the heat throughout. As it will start cooking, the meat will release a lot of juice which you will need to evaporate completely. 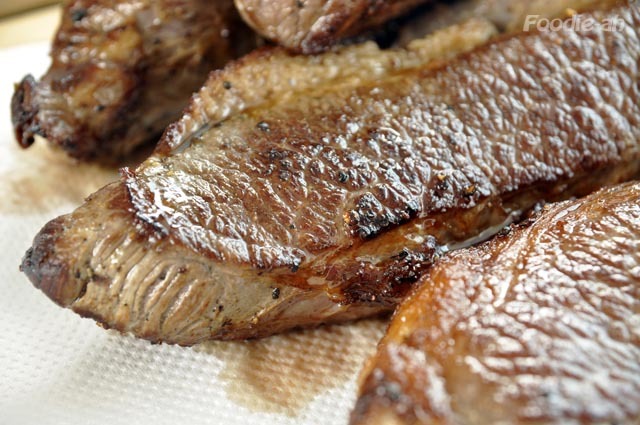 It is very important that the meat is cooked in isolation from the vegetables, in order to remove all of its liquid content and sear it by causing a Maillard reaction. 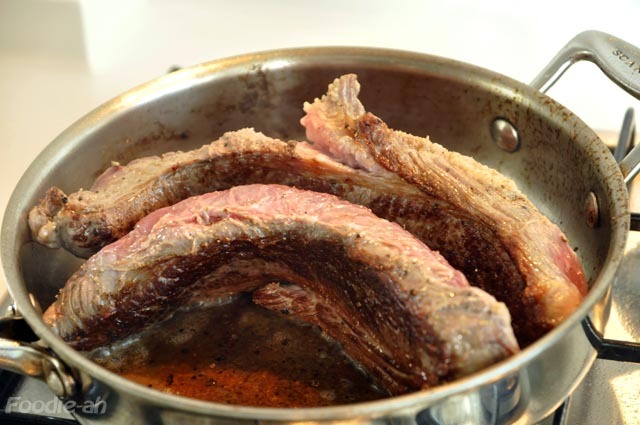 You should really start smelling the same aromas that steaks release when you pan fry them. This process can take about 30 minutes for 1.3 Kg of meat. 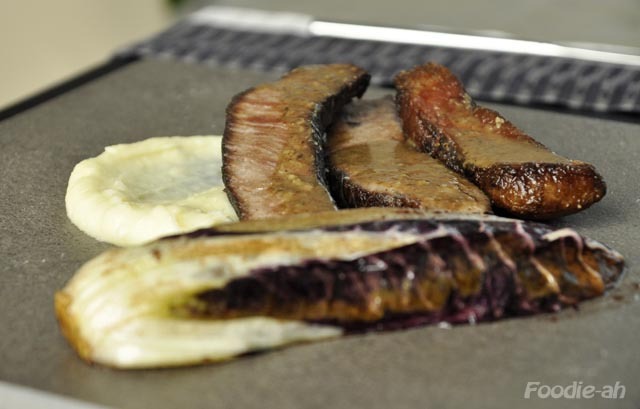 You can clearly see in the two pictures above the difference in texture and color between beef that has just been turned and heated thoroughly and is still juicy, and the one below, which has been dried out and is crispy and tasty. 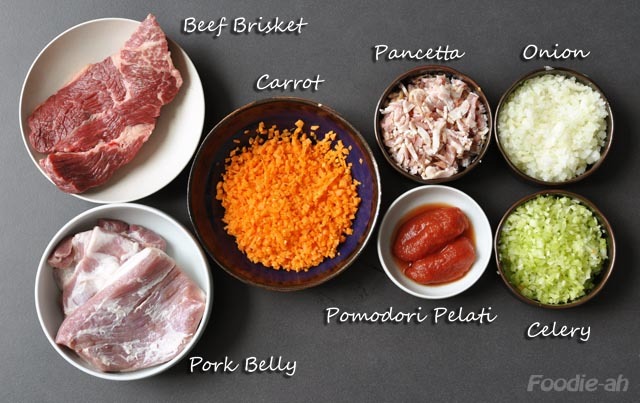 As Gordon says: "no color - no flavour"- and you will hardly get color on the meat if you mix soffritto and meat all together, due to the different cooking times. You can then deglaze the pan on high heat with a glass of red wine, mixing rapidly to detach any bits of meat stuck at the bottom of the pan. When all the alcohol is evaporated, pour the soffritto back into the pan, add the tomatoes and the stock, and let the sauce simmer gently for about 3-4 hours. You will need to regularly check progress, stir the sauce and make sure that it does not dry out, adding water if required, and milk in the quantities indicated towards the end of the cooking process. Add salt if required, when most of the juices are evaporated. Once the sauce is ready, either serve immediately or freeze for later use. If you decide to freeze it, make sure that you cool it down rapidly by placing the pan with your kitchen sink filled up with water, and changing the water continuously as it heats up. 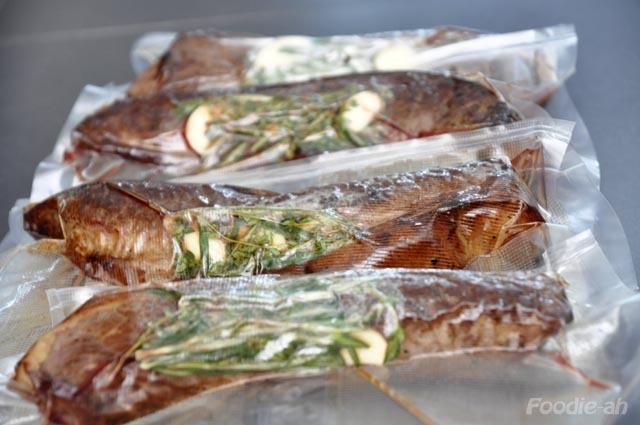 When the sauce is at room temperature (this should happen within 15 minutes or so), place it into freezer bags, seal them, then put them into an ice bath (made of 30% water and the rest of ice) for about 10-15 minutes, until they are very cool, and then place them in the freezer. Private Affairs organised a photography event as part of their 1 year anniversary celebration. The participants submitted their favourite picture to take part in the contest, and 5 were selected out of 38. Those 5 participants gathered at the restaurant last Saturday to shoot pictures of about 15 dishes prepared by Paul, the head Chef at Private Affairs. Out of all those shots, each of the 5 participants was asked to select one picture to submit to the competition. Mine was the one above. To see the others, you can take a look at the Facebook page of Private Affairs. Following below some other pictures I took on the day of the shooting. On Friday night, Private Affairs invited all their most regular customers and partners to visit the restaurant in order to celebrate their first anniversary. The shoot-out award ceremony was part of the event. 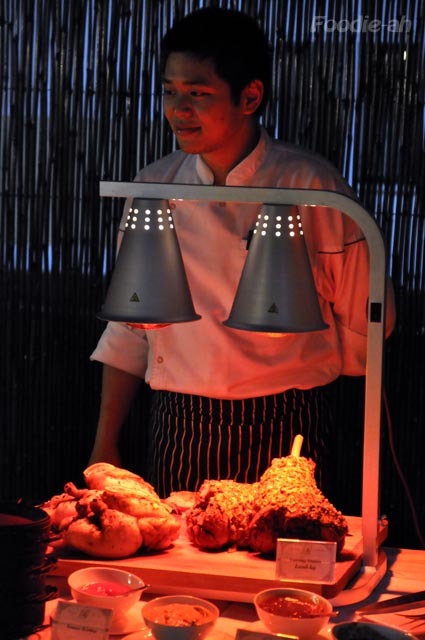 Some great food was served during the event, including roast chicken and lamb, barbecued scallops and steaks, tasty mini-burgers, oysters and sashimi. Wines and sake were also free-flow. 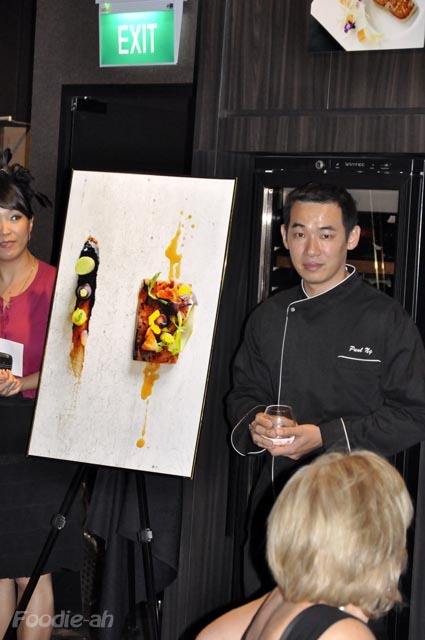 Above is the Chef (Paul) next to a large print of the winning picture. The print will be hang in the dining room of the restaurant. 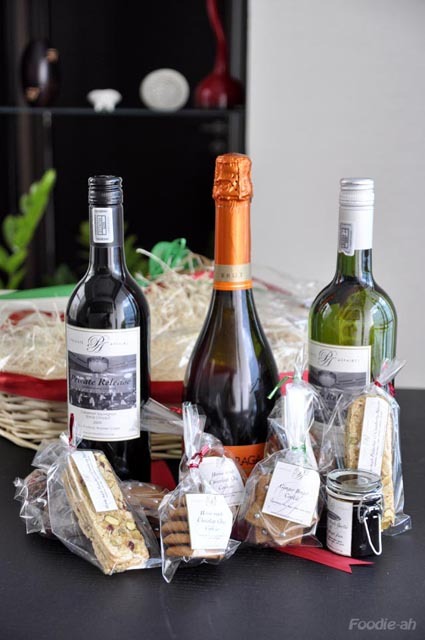 Part of the price was this Private Affairs Christmas basket filled up with goodies, including wines, cookies and jams made by the Chef! 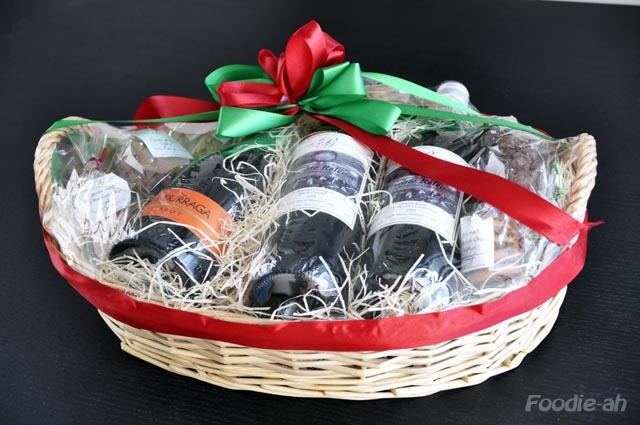 Other baskets were also distributed to other customers as part of other fun competitions and lucky draws. 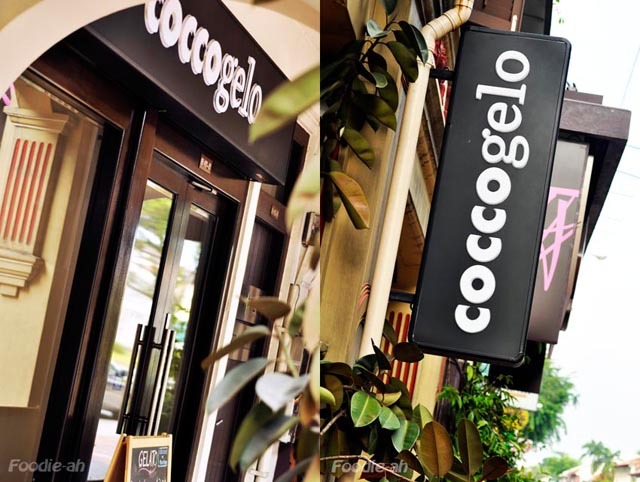 The news is that the restaurant will be moving to Raffles Place next April. They decided to cater to the business Crowd in the CBD and leave Joo Chiat. There were some contrasting opinions in the audience when this was announced by Sharon. 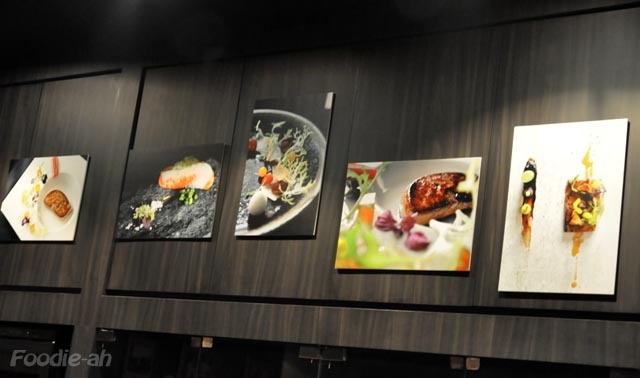 Some still love the idea of a fine dining place hidden in a Joo Chiat shop house. I must say that it was great fun to take part in this photo competition, which was very well organised. The anniversary celebration was packed with fun people and good food and it was great to be part of it. I wish Private affairs the best of luck with their second year of activity!